Omnidirectional inline microphone easily picks up your kids’ voice, and inline controls allow them to answer the phone when they’re on-the-go! Plug these into anything – iPhone, iPod, Samsung and other Android phones, tablets including the iPad, portable gaming systems, laptops, desktop computers and more! They also work great for audio/visual entertainment systems in your car and for long drives. Any device with a standard 3.5mm headphone jack will work with these headphones. Let your kids talk on the phone hands-free with the inline microphone on these bluetooth headphones – the mic is omnidirectional, so you even if someone’s not speaking directly into it, it’ll still pick up the voice. What’s more, with the built-in phone control your kids can answer calls with the simple press of a button! Detach the audio cable and connect to any bluetooth-enabled device to allow your kids to enjoy wireless listening! These bluetooth headphones are fully equipped with Bluetooth functionality, so whether your kids are outside being active or just hanging around the house, they can can easily listen to anything they want – wire-free! 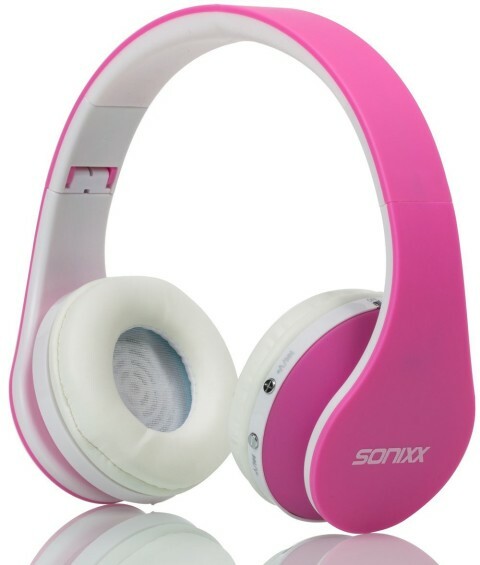 These wireless headphones come in your choice of blue or pink, and are perfect for kids – both boys and girls. The comfortable ear pads are soft and cushy, while the headphone frame is tough, durable plastic that is lightweight at the same time.